Members of the Southeast Iowa Civil War Roundtable left from Burlington on Thursday, May 23, 2013 to attend events surrounding the re-dedication of the Iowa Memorial at the Vicksburg National Military Park on Saturday, May 25, 2013. The monument, a peristyle Doric order temple featuring an equestrian statue on its platform, was originally dedicated on November 15, 1906. The Iowa legislature authorized the expenditure of $320,000 to restore the monument in 2012. In his remarks on Saturday morning, Iowa Governor Terry Branstad briefly described the efforts of the Iowa troops who fought in the strategic Civil War campaign one hundred fifty years ago as he rededicated the recently restored Iowa Memorial before a crowd of several hundred assembled onlookers on a warm sunny day. Sharing the platform with Branstad was former Mississippi Governor Haley Barbour who also memorialized the struggles of all those who participated in the siege of Vicksburg during the spring and early summer 1863. Also making remarks were Michael Madell, Superintendent of the Vicksburg National Military Park, Iowa State Senator Dennis Black, Dr. Jeff Kaufman, Former Iowa State Representative and Shawn Benge, Deputy Regional Director of the National Park Service. Throughout the ceremony the VNMP Gun Crew proved artillery salutes. SEI CWRT President, Al Ourth; Vice President, Dan Gillett and member Charles Varboncoeur, attended the re-dedication dressed as Civil War Union soldiers while members Dessa Rodeffer and Deb Olson were attired in reproductions of ladies Civil War period clothing. After the ceremony the group drove along the self-guided tour pausing to visit the Illinois monument, the USS Cairo Museum and Gunboat and the VNMP Visitorâ€™s Center. 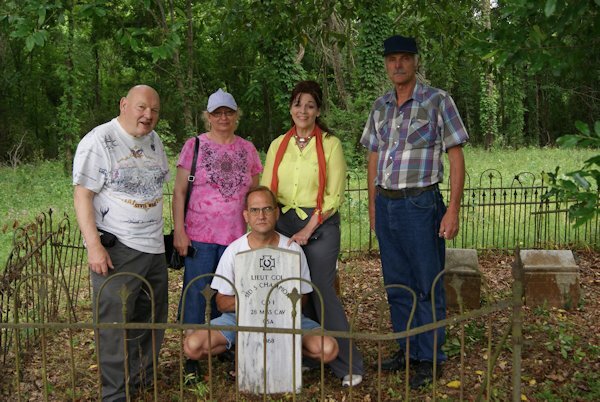 After leaving the military park the group changed back into their civilian clothes to enjoy a private guided tour of the Port Gibson battlefield area. On Friday morning, the group enjoyed a private guided tour of the Champion Hill Battlefield. Later that afternoon and evening they attended A Southern Summer Supper, a dinner reception to welcome the re-dedication delegation at the Great Hope Manor in Vicksburg. The dinner menu featured a selection of Mississippi traditional foods including catfish, fried chicken, grits, summer squash, purple hull peas, cole slaw, biscuits and cornbread. Afterwards they finished the evening by enjoying a concert of patriotic and military songs, as well as some traditional tunes and compositions by Stephen Foster performed by the Navy Band Mid-South at the band shell at the entrance to the military park. Before leaving Vicksburg Sunday morning, the group stopped briefly to visit the iconic Old Courthouse Museum with its grand view of the surrounding countryside and the Mississippi River below. 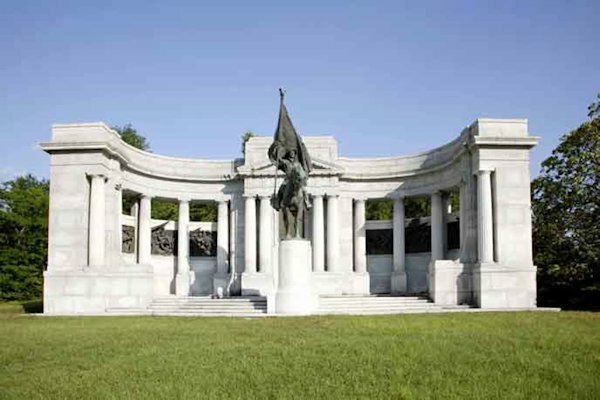 While the Memorial Day week-end visit offered only a brief taste of the history-steeped sites awaiting visitors to the Vicksburg area, it also served to vividly emphasize the noble sacrifices of those who served our country during the Civil War and in all Americans wars since that. To them we owe a great debt of gratitude for it was their service that has allowed this country to remain, in the words of the Pledge of Allegiance "one nation, under God, indivisible with liberty and justice for all.â"
Newly restored Iowa Civil War Monument was rededicated in a moving ceremony by Iowa Governor Terry Branstad and Iowa and Mississippi officials Saturday morning in Military Park, Vicksburg, MI. Members of SEICWRT Charles Varboncoeur, Deb Olson, Dessa Rodeffer, Vice President Dan Gillett, (Pres. Al Ourth not pictured), with tour guide Sid Champion V, who gave a moving tour of the paths of Grant's siege.